Morecambe’s unbeaten pre-season continued with a 2-2 draw against Blackpool on Tuesday afternoon. In a game played behind closed doors goals from Lee Molyneux and Kevin Ellison saw The Shrimps twice come from behind as the game ultimately ended honours even. The visitors were captained by Jack Redshaw on his return to the Globe Arena while former Crewe, Sheffield United and Coventry striker Shaun Miller played the final half an hour for Jim Bentley’s side as he looks to replace the diminutive front man. 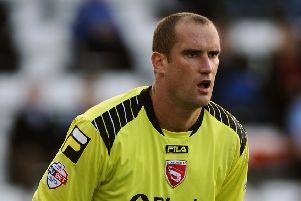 Mark Cullen gave Blackpool the lead 18 minutes in, firing a low shot beyond the reach of Barry Roche from 12 yards after jinking his way past Andy Parrish. The Shrimps then had the better of the chances with Molyneux, Laurence Wilson and Tom Barkhuizen all having sights of goal. In a physical clash between the two Lancashire rivals Bright Osayi-Samuel became the first player subbed at the request of referee Jeremy Simpson after a challenge on Peter Murphy shortly before the break. The host continued to be the brighter after the interval and after Alex Kenyon has stung the palms of Kyle Letheren Molyneux levelled on 57 minutes with a fine low finish from 15 yards. It was the visitors who went back in front 20 minutes from time with trialist Adam Drury firing in a deflected shot that went through the hands of Roche. Ellison then levelled things up on 82 minutes arrowing a left-footed shot into the bottom corner from 20 yards. There was time for more action with Alex Kenyon the second player ordered off by referee Simpson after going in hard before Luke Higham nearly deflected the ball past his own goalkeeper two minutes from time as he intercepted a vicious Laurence Wilson cross. The Shrimps complete their pre-season programme against a Liverpool XI at the Globe Arena on Saturday.